The industry’s first fully integrated power management solution for double date rate (DDR)2, DDR3 and DDR3L memory subsystems in automotive and industrial applications has been introduced by Texas Instruments. The TPS54116-Q1 DC/DC buck converter is a 2.95 to 6V input, 4-A synchronous step-down converter with a 1-A peak sink/source DDR termination. It also has a buffered reference that reduces system size by up to 50% compared to discrete implementations. Designed for automotive applications such as infotainment, Advanced Driver Assistance Systems (ADAS) and instrument clusters, the TPS54116-Q1 can also power DDR memory in telecommunication, test and measurement, and factory automation equipment. 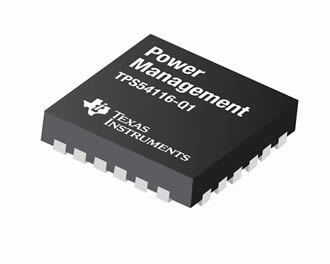 Used in conjunction with TI’s WEBENCH online design tools, the TPS54116-Q1 simplifies power conversion and speeds the power-supply design process. Download the Automotive Power Reference Design for Low Power TDA3x Based Systems to create an integrated, size-optimised power supply for ADAS featuring the TPS54116-Q1 when using TI’s TDA3 system on chip.